Mount St Bernard College is located at Herberton, on the Atherton Tablelands. Established in 1921 by the Sisters of Mercy as a day and boarding school, the College enjoys a proud history and a rich tradition. The Sisters of Mercy began their educational ministry in the Herberton district over 100 years ago with the opening of St Patrick's Parish Catholic primary school in 1910. Responding to the changing educational needs in far north Queensland, the original Sisters of Mercy Boarding School, St Mary's Cooktown, was moved to Herberton in 1921. The Sisters of Mercy gifted the college to the Diocese of Cairns in February 2006 and it is now administered by Cairns Catholic Education Services. As a Catholic school, Mount St Bernard College is open to all who support its values and are seeking a holistic education. 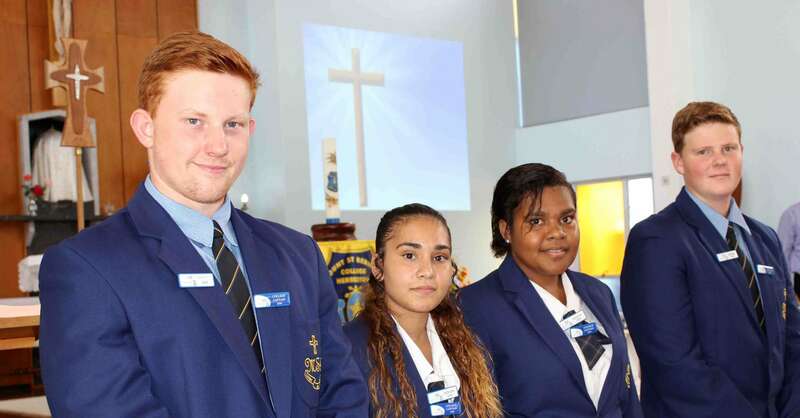 The College serves local students from the Tablelands district and welcomes as boarders students from rural and remote areas of the Far North and North West of Queensland. Mount St Bernard College also reaches out to students from the remote communities of Cape York, the Gulf of Carpentaria, the Torres Strait, Northern Territory & Papua New Guinea. With male and female day students and boarding for both girls and boys, the College enrolment reflects a broad spectrum of cultures and experiences. Mount St Bernard College strives to enable its students to develop a broad range of skills enabling them to become the persons God created them to be. Mount St Bernard College: Mercy Traditions, Spirited Learning and Building Futures, promotes a holistic approach to education in a caring Christian environment. The MSB curriculum has been designed to provide diverse pathways to meet the wide ranging of needs of the students we serve. We offer a broad curriculum intended to contribute to the deep learning and holistic development of students. In response to the needs of individuals and their breadth of aspirations, an MSB education can help prepare young people for direct entry into the world of work or lay the foundation for tertiary studies through our academic programs. A range of Vocational Education & Training (VET) offerings complement the academic curriculum. These include VET certificate training in IT and Media, Engineering Pathways, Education Support, Sport and Recreation, Public Safety, Hospitality and Allied Health Assistance. The college also offers transition learning units that focus on building literacy & numeracy skills to accelerate students. MSB is renowned for its expedition programme. Individuals have an opportunity to challenge their comfort zone and develop traits of self reliance, leadership and teamwork. Sporting opportunities - regional, state & national Representatives. Mount St Bernard College is a school in the Mercy tradition. As a Catholic school, the values of Mercy education - love, respect, participation, service and personal best effort - have endured as proud traditions at the heart of the life of the College. 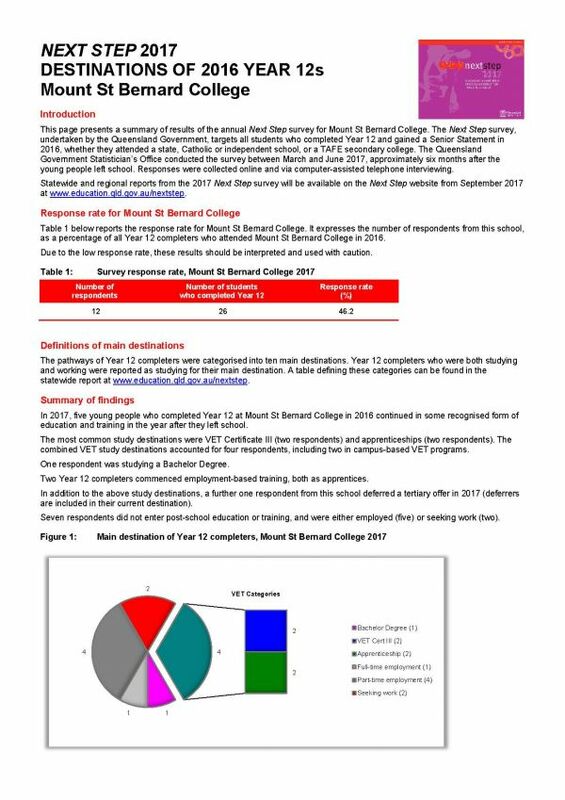 Mount St Bernard College is committed to providing a safe, respectful and disciplined learning environment for students and staff where students have opportunities to engage in quality learning experiences and acquire values supportive of their lifelong wellbeing. MSB values respect, participation and personal best. Students are supported to respect themselves, fellow students and adult members of the school community. Respect is experienced in positive relationships, affirming language and peaceful actions. Respect for school facilities and the surrounding environment is also promoted. Importantly, student respect for the purpose of school is observed in students' positive engagement in their learning. Bullying behaviours are proactively addressed by MSB's structured development of students' Social Emotional skills. MSB's Student Wellbeing & Pastoral Care Team respond to individual bullying incidents to both support students subjected to unwanted and inappropriate behaviours and assist students engaging in bullying behaviours to address their inappropriate attitudes and actions. The Pastoral Care and Student Counselling Team also work actively in the residential setting, leading discussions and activities focussing on anti-bullying strategies and learning about resilience and respect. Middle Leaders in Pastoral Care liaise with the Head of Pastoral Care and the AP-Mission on student matters. The Heads of Residential work closely with day school personnel. School Wide Positive Behaviour Support is designed to facilitate high standards of behaviour so that learning and teaching can be effective and students can participate positively within our College community. We are committed to building strong partnerships with parents through regular contact and encouraging open relationships between staff and parents supportive of students' growth and learning. Students and families are also encouraged to participate in community social events throughout the school year. NAIDOC celebrations are very popular. The college Facebook page is very popular and a wonderful source of information. Many families access this regularly. The Facebook page is updated each week. Mount St Bernard College has a Parents and Friends Association which meets twice per term. Meetings are advertised in the newsletter. Parents are invited to attend or join the group regularly. In 2017, the number of eligible respondents were 127 and 43 parent responses were received (33.9%). The overall satisfaction score is 81%. 1.The majority of the responses from the survey indicate strongly that academic excellence, size of classes/school and individual learning focus are the most important reasons for school selection. 2.Analysis of School Strategies has highlighted gaps in programs and events. These strategies include areas of Associations, Communication, Events, Facilities, Planning and Programs. 3.A comparison of responses by Key Areas of Learning & Teaching, Resources, Leadership, General, Improvement Processes and Catholic Ethos all recorded a consistent rating of a good or excellent satisfaction rating. 4.Analysis of responses by Key Area and Marketing Information Sources indicates that advert/media, past student and website/internet information sources generally showed a positive variance in 2017. Word of mouth/referral as a source of marketing information showed a negative variance in effectiveness in all areas. 5.Analysis of responses by Key Area and School Sector made by parents generally showed a good or excellent satisfaction rating. 6.Responses to Open Questions provide extensive evidence of positive feedback as well as suggestions for improvements. In 2017, the number of eligible respondents were 115 and 75 staff responses were received (65.2%). The overall satisfaction score is 75%. Analysis of School Strategies has highlighted gaps in programs and events. These strategies include areas of Associations, Communication, Events, Facilities, Planning and Programs. Responses to Open Questions provide extensive evidence of positive feedback as well as suggestions for improvements. Analysis of Detailed Responses by Statement by Key Areas of Resources, Leadership, Improvement Processes, Staff Engagement and Catholic Ethos will provide information on areas for improvement. Parents are encouraged to contact the school on the day that a student is absent. If students are absent without notification, a MSB staff member telephones parents on that day. Mount St Bernard College has a proactive Pastoral Team Care who monitors and supports maximised student attendance. Individual students at risk through non-attendance are counselled and supported to maximise their participation. Boarding students are always accounted for - if unwell they remain in the Morrissey Boarding House. Re-engagement with Religious to support pastoral care and student wellbeing. Deacon Alban Hunt working with RE staff and classes. Learning Support "LST school officers"
Up skilling school learning officers "offering PD"
Integration of counselling services - Two counsellors employed on a 1.0 FTE basis. Employment of Indigenous Liaison officers who work as pastoral support for students and important contact for families. Resourcing for excellence in learning outcomes, equity in learning provision and outreach for new mission. In 2017, the number of eligible respondents were 198 and 49 student responses were received (24.7%). The overall satisfaction score is 75%. 1.Analysis of School Strategies has highlighted gaps in programs and events. These strategies include areas of Associations, Communication, Events, Facilities, Planning and Programs. 2.A majority of the student responses agreed with the statements relating to the areas of Catholic Ethos, Leadership, Learning & Teaching, General, Resources and Improvement Processes. 3.Responses to Open Questions about what they like about the college and what they would like improved could be used to identify the future focus of efforts to improve engagement and retention.